Wood Preservatives are chemicals that are used to increase the durability and resistance of wood, timber, wood structures or engineered wood by protecting them from the attack of insects (termites) and fungus. Termites, also known as white ants are secretive pests which devours large amount of wood and other materials containing cellulose. They weaken the wooden structure from the inside out and can go undetected for a long time as they burrow themselves deeply inside the furniture. The damage caused by them can be a costly affair and sometimes impossible to repair. 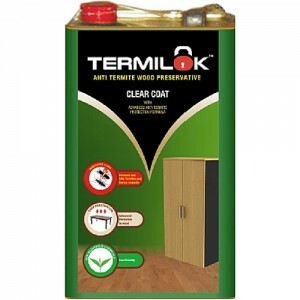 Jubilant offers “Termilok”, an easy to use anti-termite eco-friendly wood preservative. Its Advanced Termite action formula offers a clear coat protection to the substrate and gets quickly absorbed into it. Termilok, as compared to its competitors has lesser odor, is fast drying and does not cause irritation to the eyes during the application.